Eritrea’s constitution — written in 1997 — remains unimplemented. The result? No separation of powers between the legislative, judicial and executive branches of state exists; all checks and balances expected in a democratic state do not exist. Compulsory and indefinite conscription is an ingenious means of controlling the economy, whilst simultaneously allowing impunity for the use of forced labour, sexual abuse or torture during military service, knowing that criminal justice will never prevail. Concepts such as freedom of expression exists only in theory, not exercised since the 2001 ‘Crackdown’ when private media was closed, journalists forced into exile and many were imprisoned for their opinions. Try and exercise your freedom of expression and you will be held incommunicado for indefinite period in some of the harshest prison conditions known to humankind. The day 18 September 2014 marked the thirteenth year since those arrested during the ‘Crackdown’ disappeared. To this day their whereabouts remain a subject of conjecture, except for their jailers, no one for certain knows where they are and who is dead or alive. I have not yet mentioned the restrictions to movement, religious expression, or opposition to government. What we see is a vigorous endeavour to break the human spirit in order to rule with an iron first. This is no democracy. It is painfully perplexing to be able to list — just at the top of my head — some of the tools needed to immediately move Eritrea onto a more democratic path, and not see them realised. To begin with, implement the constitution, set the boundaries of power — use them — then align them with standards and conventions created to guide states in the realisation of democratic leadership. Rely on the instruments such as the African Charter on Democracy, Elections and Governance — a charter rooted in promoting and advancing constitutional order, legitimately elected authority, and the respect for human rights as supreme. It is undisputed that the rule of law abandoned will produce an oppressed population. It is therefore vital that Eritrea restores national pride by empowering its society instead of enslaving them in the context of indefinite national service. Empower a society that is not only knowledgeable of but can practice its rights and where prisons do not hold scores of political prisoners but actual criminals who are themselves convicted in courts that are truly independent and fair. 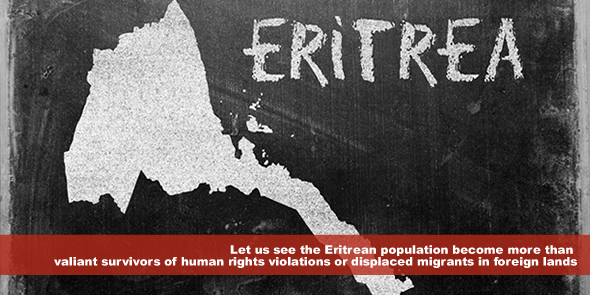 Let us see the Eritrean population become more than valiant survivors of human rights violations or displaced migrants in foreign lands who have lost hope in their country’s ability to respect their dignity. Dear sister Thato, I hope you are being working in well and thanks a lot for your an essential article. however we as in the African Continent as human rights activists our journey to establish democratic principles and systems as promote and fulfill the values of human rights and rule of law amongst our nations elsewhere not easy or difficulty and complex. infringement of the rule of law and democracy not only in Eritrea but in major of our countries as above commented on by my colleague from South Sudan as well am not far from Darfur region in Sudan as lawyer of human rights. what am going to add to your article is let us all to promote these values amongst our people beginning to include in our basic educational systems and in our universities studies. we also make social media mobilization including face book blocks, online services to promote these values. more important for this we must make effective contact between us by any possible to exchange information relate to rule of law and human rights without limit ourselves facilities from our leaders or other donors. finally i hope you continue the same activities to realize all our people gain free elected system, justice and human rights. thanks also to Africlaw staff . Thank you Biel and Abass Y. A. Atim for support and thought provoking comments.